After the excellent business opportunities and partnerships fasten last year in Bogota, Btobet confirms its presence at Fadja 2017, providing the possibility to all LatAm operators to have a live demo of its clever omnichannel, multi-currency, multi-jurisdiction and multi-brand iGaming platform and Sportsbook software. BtoBet’s expert will be showcasing at stand number 49 at FADJA- Bogota to explain operators how to manage their gaming and sportsbook content everywhere and anytime, from land based to online, including mobile. At the stand, licensees will also have the possibility to book their personalised demo to discover how BtoBet’s multi-jurisdiction platform, compliant with several countries’ requirements can help them with their operations in strictly regulated, including Latin American ones. Additionally, operators at Fadja will see how to manage quick and safe transactions through BtoBet’s multi-currency platform, which permits over 200 types of payment methods in all currencies. 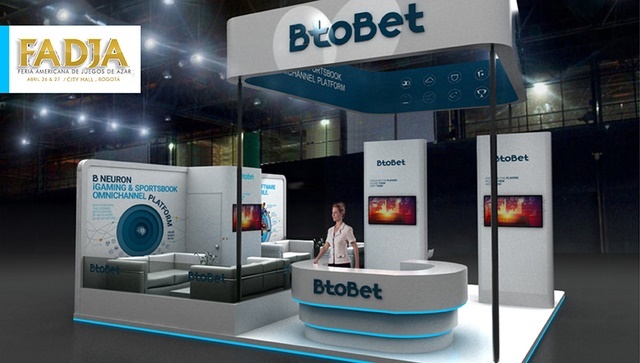 At its booth, BtoBet has created a special space for all companies that need support to develop their operations in South America and willing to discover also the technology features of BtoBet’s White label solution, ready to be distributed in LatAm in partnership with 24 Win’s PlutOnBet.